It was a case of third time lucky. I’d been to Southern Thailand’s twin pinnacles of Hin Daeng and Hin Daeng twice before, eager to see the manta rays that frequent the two dive sites. I’d heard plenty of stories from various divers about spectacular encounters with the legendary devil fish – “mantas in-yer-face” as one instructor enthusiastically put it. On both previous occasions, there’d been no sign of the manta rays. But this time, even as I sank only a couple of metres below the surface, my heart surged as I saw the unmistakable tip of a manta ray’s wing flip over the top of Hin Daeng’s pinnacle. My buddy and I raced towards it, but we needn’t have worried: while my previous encounters with mantas had been a few precious seconds spent watching them soar through the water and then spin away into the blue, here at Hin Daeng they were seemingly unphased by the arrival of divers. Over the next hour I hovered at around 15 metres, watching not one, not two, but five different mantas swirl around, above and below me, some veering by so close that they momentarily blocked out the light with their awesome, graceful bulk, their huge, smooth white underbellies bringing a different dazzle to my eyes. Frankly, I was having difficulty believing what I was seeing. Every moment I expected them to suddenly disappear, but they didn’t. I couldn’t stop grinning – this was a dive dream come true, the sort of dive you always hear about from other people that never seems to happen to you. Already well aware of my good fortune as I did my safety stop, still watching the mantas circle Hin Daeng’s apex, I idly glanced down and nearly spat out my regulator. There beneath us the creature every diver yearns to see, the biggest fish in the world – the whale shark. I grabbed my buddy, frantically signalling and pointing downwards, all decorum gone. We watched its distinctive blue and white-spotted, blunt nosed bulk move rapidly around the pinnacle and then disappear back into the deep. The surge of euphoria I first felt on seeing the mantas at the beginning of the dive had come back full tilt, leading me to clamber back onto the boat with a huge smile and offering condolences to those who had exited the water before the whale shark’s brief appearance. I’d come to see if Southern Thailand’s dive sites had escaped the tsunami unscathed, and this dive was the most emphatic positive answer imaginable. On my previous pre-tsunami dives I’d had to content myself with the twin peaks’ more reliable inhabitants, including clusters of basking leopard sharks, groupers and cuttlefish, all set amongst the dramatic backdrop of Hin Daeng’s sheer drops into the ocean’s depths. Strong currents and murky viz mean that this isn’t a site for novice divers without an experienced guide: Both peaks have a diverse collection of coral and critturs clinging to them as a vantage point in the middle of the sea. 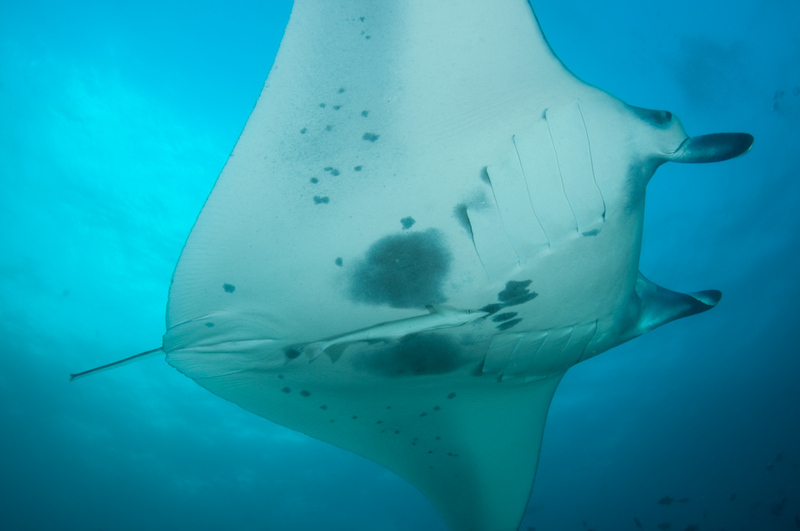 Even without the mantas, the two peaks offer a memorable dive location – with them, it makes for truly unforgettable diving. Hin Daeng and Hin Muang are just one of the top notch Southern Thailand dive sites that are scattered to the east of Phuket. There’s also the towering limestone rock of Koh Bida Nok and the circle of craggy islands known as Koh Haa. The sites are most easily accessible by day trips from the Thai islands of Koh Lanta and Koh Phi Phi, or by liveaboard from Phuket. Koh Phi Phi, world famous as the filming location of the movie The Beach, was badly damaged during the tsunami but has made a rapid recovery in the ensuing months with hotels and dive operators already re-opening. The laid back island of Koh Lanta, by comparison, was almost left untouched, and during my visit there were numerous dive shops offering day trips to the three key sites. Thanks to their relative remoteness, these sites have all remained in great condition, untouched by the tsunami or the impact of tourism. Indeed, Koh Haa’s circle of five huge oceanic rocks looks like the secret lair of a James Bond villain. The rocks form a breathtaking lagoon that is protected from the outside elements. Underwater, Koh Haa is as unabashedly pretty as it is on the surface. Koh Haa One is a fascinating wall dive, with serried rows of coral resembling aquatic rice terraces. There’s a swimthrough known as The Canyon, at the deepest part of which live a tigertail seahorse, bright yellow and happy to pose for photographs. There’s also a coral chimney which opens out into an easily exited cave at 7 metres. What I found overwhelming about dives at Koh Haa was both the sense of space – visibility was uniformly excellent on each of my visits – and the sense of abundance. There are so many fish around, and with a good dive guide, there are numerous hidden treats to be discovered, like the Durban hinge beak shrimp and ghost pipefish. Koh Haa Yai is possibly even more dramatic thanks to The Cave, an airpocket where you can ascend and be inside the rock itself amongst the stalactites and stalactmites. The shaping of the rock by centuries of erosion makes it feel almost cathedral-like once inside, and the play of light on the water as you ascend and descend is quite unique – and can also be a little disorientating, so care is required. The dive site proper is a big wall with a shallow reef at its top, amongst which we found two octopi mating and a lone barracuda toying with a huge fishball just off in the blue. The lagoon itself also offers some great shallow diving, with a pristine reef that harbours mantis shrimp who eye passing divers suspiciously and, after a lot of peering in crevices, the harlequin shrimp, universally known to dive guides as “the funky shrimp” as its amazing colours make it look like it’s ready for a night at the local disco. It’s the stuff of a macro photographer’s dreams. Koh Bida Nok is also primarily a macro paradise: it’s a huge rock that forms a near vertical craggy wall in the water, down to around 30 metres, that stretches around into a shallow reef. There is a profusion of corals here, along with plenty of creatures making their homes in the wall’s crevices. Whale sharks have occasionally been spotted here too, but it’s the small stuff that generally provides the interest. Strong currents and poor visibility on each of my visits mean that, in truth, I can’t say this site was a personal favourite, but that was more bad luck on my part than anything else. Given the variety of dive experiences on offer from these three sites, it’s worth taking time to explore each of them in turn. They are dive locations that repay revisits, each one with its own unique character that lingers long in the memory. Certainly the manta rays of Hin Daeng and Hin Muang are a headline attraction, but their appearance isn’t essential for great diving experiences amongst these underwater gems in Southern Thailand. Start Planning Your Thailand Dive Trip Now! :: Check the availability and pricing of liveaboards in Thailand and book online. :: Find the cheapest flights to Thailand - Phuket (airport code: HKT) is the nearest airport for diving the Similan Islands. You can get direct international flights to Phuket or go via one of Bangkok's two airports - Suvarnabhumi (BKK), the main airport, or Don Mueang (DMK), the low cost carrier terminal. :: Get dive and travel insurance for Thailand from World Nomads - make sure you're covered above and below the water. World Nomads lets you buy insurance online quickly and easily. :: Find available places to stay in Phuket for before and after your liveaboard on Booking.com - usually you can reserve a room with no upfront payment. Pay when you check out. Free cancellations too. :: Need inspiration? See our Best Places To Dive In Thailand for ideas of where to go and what to do. Are There Great White Sharks In Thailand?